Wavelengths from Blue to Red and beyond to IR are offered in nanosecond pulses (~3ns) at high repetition rates up to kHz frequencies. 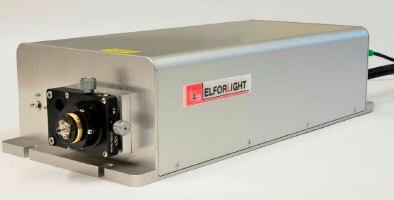 Elforlight have pioneered short nanosecond (<2ns) pulses for photoacoustic microscopy, at standard 1064/532 wavelengths. 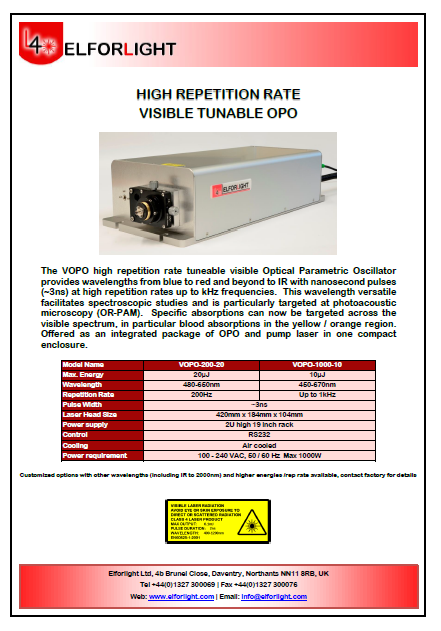 This wavelength versatile has been developed in response to demands for tuneability to facilitate spectroscopic studies. Specific absorptions can now be targeted across the visible spectrum, in particular blood absorptions in the yellow / orange region. IR versions around 1700nm target lipid (plaque) absorptions at up to 5kHz. MIR outputs to 3 to 4 microns also available.